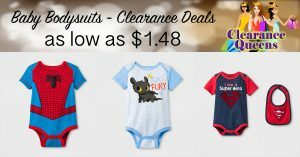 Target has these adorable Baby Bodysuits on Clearance right now for $1.48!! It appears all Newborn sizes are gone but sizes 0-3 month and on up appear to all be available to purchase. Click the below Red buttons for each style.